This month it's the turn of Happy Fish Sushi. 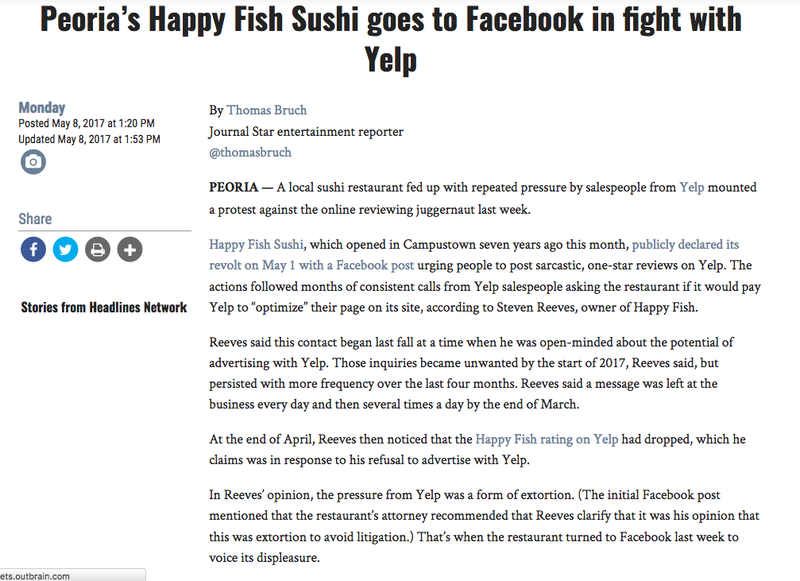 According to the Peoria Journal and Star (we're sure you all read that!?) they allege that Yelp has been bombarding this business with sales calls and the business itself alleges that their Yelp rating dropped - inferring that Yelp were filtering out positive reviews. Yelp - the largest single general reviews site on the planet - pulled its sales operation out of the UK and Europe at the end of last year. This decision may not have been entirely unrelated to the Competition and Markets Authority's (CMA) involvement in the regulation of the UK reviews market. 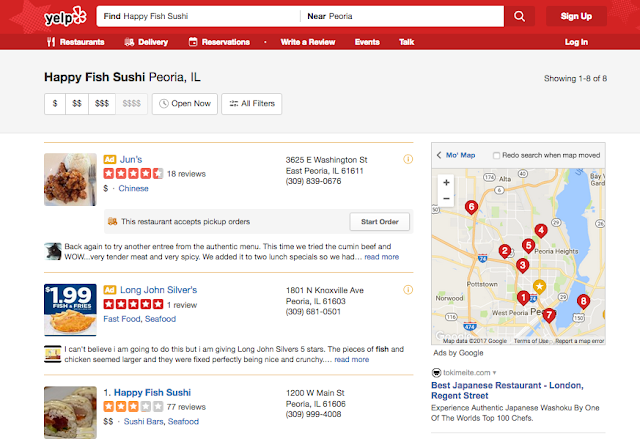 Yelp's business model is based on selling advertising on non-paying business's listings. Fair? We'll leave you to decide. In desperation - we assume - this business has decided to reward customers for writing one-star reviews! But seriously: it is difficult for a reviews site to comply with the spirit, let alone the letter, of the CMA regulations - which have the force of law. 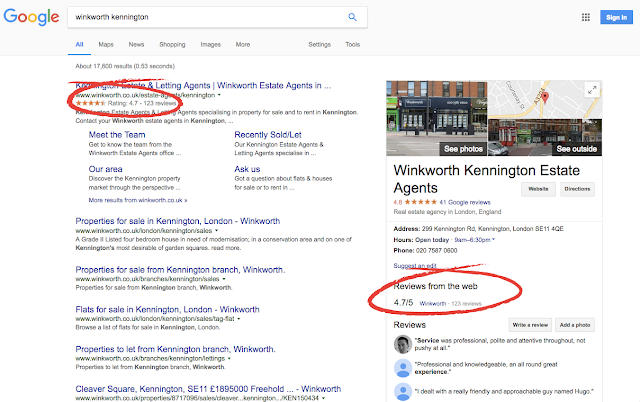 Most reviews sites in the UK rely on Google partnering for much of their revenue - which in turn relies on the client business being willing to tie themselves to long-term pay-per-click strategies in order to see their review scores appear in search - scores that, with effective review management would appear next to the business's natural listing - and in the knowledge panel, for free. Note the 'write a review' button - anyone can write a review at any time - no wonder potential clients give their reviews credence. 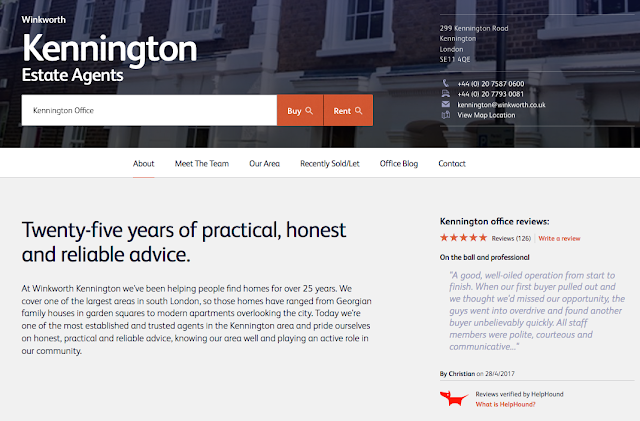 We hear first-hand reports of review sites employing boiler-house techniques - multiple calls by different staff, often in the same day, is just one example, 'free trial' periods (during which the business will be innocently generating revenue for the review site) is another. Often the offering is non-compliant in some way (check it against the six criteria here). We consider that it is well-nigh impossible for a commercial review site to comply with the current CMA regulations and make money at the same time - the conflict of interest is just too great. It is possible - although we hasten to add that we have no evidence - that Yelp's decision to quit the UK was influenced by legal advice; after all their business model rests on being able to up-sell advertising above its natural listings as in the screenshot above, something that the CMA might not entirely happy about. Businesses must realise that there is no 'magic bullet' where reviews are concerned, that whatever solution they adopt must not mislead consumers and must be truly open and accessible to all. The only solution - fortunately for well-managed businesses with a strict consumer focus - is proper professional review management; compliant with the regulations and effective for the business and consumer alike.